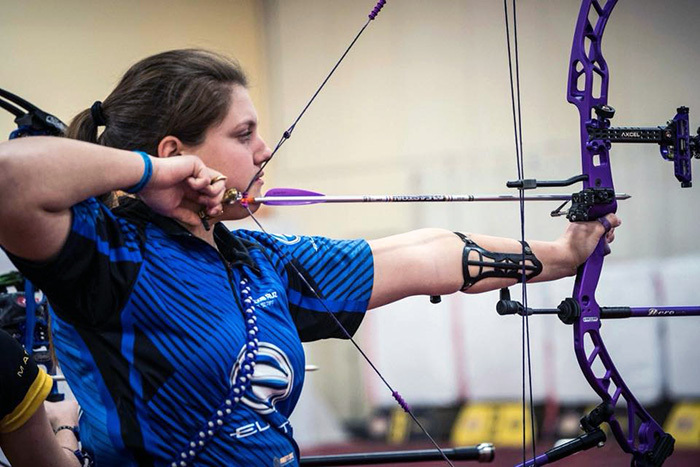 When she’s not in her nursing classes, GCU student Alexis Ruiz is winning archery tournaments. She recently won the compound women’s championship at a major event, the Vegas Shoot, in February. Alexis Ruiz shut out the noise. She took in a deep breath, slowly exhaled and shut out the noise as she pulled back her compound bow and eyed the target 20 yards away. Eons away. The sponsors seated around the edge of the shooting area? She ignored them. The arena full of spectators? Ignored them. And in her head, she counted to five. Then she released the bow, hurtling the arrow toward the target’s 10-ring — the center, innermost ring; the home of the bull’s-eye. It was her final shot. All three arrows within the 10-ring. All solid shots. Ruiz stepped back, smiled, almost imperceptibly, and waited. All Linda Ochoa-Anderson had to do was best Ruiz on that last shot. Her two previous tries? Like Ruiz, solid. Ruiz (second from left) has competed not just in the U.S., but Argentina, Thailand and France. Seconds later, after releasing her bow, Ochoa-Anderson – the archer expected to win the tournament — glanced back into the audience. She knew. She just knew. It wasn’t the shot she wanted, dropping the point as her arrow hit just outside the border of the 10-ring. 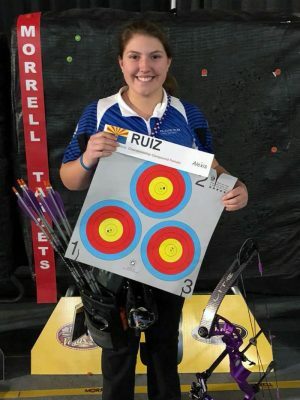 Ruiz, a nursing student at Grand Canyon University, did what she never thought she could do, at least not for someone as young as 18: She won perhaps the biggest tournament in her sport of compound archery – February’s Vegas Shoot. Even though she was on one of the biggest stages in her sport, she can’t remember taking those final shots. Winning the compound women’s championship of the Vegas Shoot wasn’t the only big accomplishment for Ruiz in recent months. She also was a 2017 World Archery Youth Champion, winning a junior gold medal in Rosario, Argentina, in October. That means, essentially, that she’s the best junior women’s compound archer in the world. 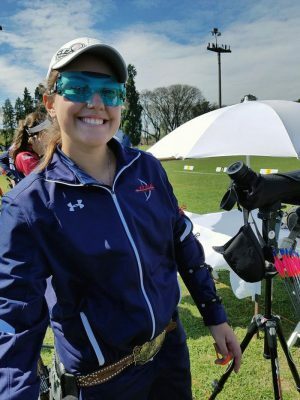 Ruiz, who is from Phoenix, won the World Archery Youth Championship in 2017 in Argentina. Unlike the Vegas Shoot, which was an indoor event, the World Archery Youth Championship was an outdoor competition. Archers have to shoot at targets 55 yards away, which is a little more than half a football field. Ruiz achieved those titles while maintaining a full course load and keeping up her grades at GCU, where she’s hoping to graduate as a registered nurse. She credited her professors with understanding her academic challenges and also supporting her busy athletic life outside the classroom. Ruiz, who grew up in Phoenix, started in archery when she was just 10 years old. “I wanted to be just like Dad,” she said of her father, who hunts with a bow. So when she found out her charter school, Hearn Academy, participated in the National Archery in Schools program, she signed up. She hasn’t looked back. It seems as if Ruiz was born to be an archer. Just a few months after she started in the sport, she qualified for nationals, though she didn’t attend. “I just fell in love with the feeling and the environment,” she said of archery – a sport, she said, that is for everyone. Ruiz practices up to six hours at a time, and she can shoot up to 300 arrows in practice. In January and February alone this year, she had six back-to-back tournaments. Besides Argentina, she has competed in such countries as Thailand and France, getting there with the help of sponsors and by coming up with funding herself. Winning the women’s freestyle at the Vegas Shoot meant taking home a total of $23,000, which she’ll invest back into the sport — all those bows and arrows aren’t cheap. Ruiz is starting an archery club at GCU. Ruiz has a GoFundMe page, but she also funds a lot of her travel herself. 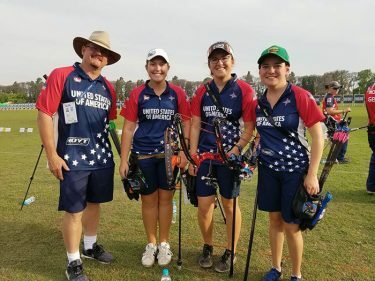 Ruiz travels to most tournaments with her parents and her coach, Mel Nichols, who led the USA Olympic Archery Team in 2012 at the London games and in 2016 at the Rio de Janeiro games. But when it comes to those overseas events, it’s usually just her and her coach; the cost of travel can be too restrictive for her whole family to attend. Travel is one of the things she loves about the sport. Having reached the professional level, Ruiz hasn’t just experienced all the camaraderie. There also are the stresses that come with any sport. Ruiz was on target at the Vegas Shoot. Ruiz said she tries not to think about everything going on around her and concentrates on what she knows how to do – and do so well. Next up are several summertime tournaments and the prospect of reaching her ultimate goal: to be ranked No. 1 in the world. While she’s a world champion at the junior level, she wants to do the same in her post-junior career. She also is starting an archery club at GCU this summer. She’s hoping the collegiate archery club will be in full swing by the fall. The soft-spoken Ruiz rarely shows a lot of emotion at these tournaments, always keeping her game face on. But some of that emotion did come through at the Vegas Shoot. “I actually cried at this tournament. It is what everyone dreams of doing – winning this tournament,” she said. You can reach GCU Today senior writer Lana Sweeten-Shults at 602-639-7901 or by email at lana.sweeten-shults@gcu.edu.